A number of warm-hearted sights and sips are adding holiday cheer to the JW Marriott Desert Springs. A lovely life-sized gingerbread house? It's currently on view at the JW Marriott Desert Springs. LIFE-SIZE GINGERBREAD HOUSE... in the lobby of the Palm Desert destination, a camera-ready casa that stands at 11 feet tall. Santa is taking some time from gift prep to visit the house from Monday, Dec. 18 through Sunday, Dec. 24, so if you and the family have been longing for a trip to a sunshiny spot, but you want some Kris Kringle time, too, this could be for you. 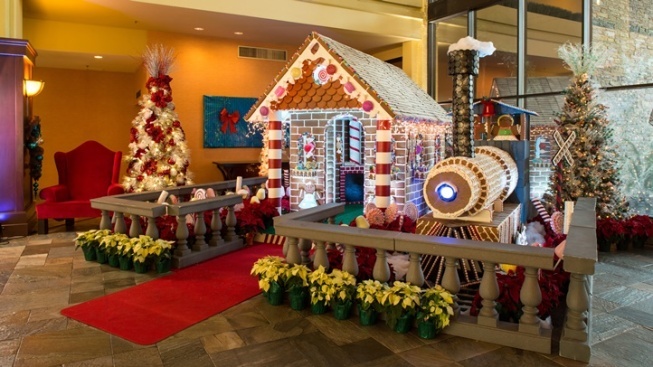 But this edible abode isn't the only sweet, and sweet thing, happening at the hotel during the December 2017 season; there's the Conductor's Cabin Room Package, which includes "a private Winter Express gondola ride through the resort's waterways" and a sip from Frosty's Flight at check-in, a libation experience that boasts customizable egg nogs and more. There are more goodies to the package, like a quartet of tickets to WildLights at the nearby Living Desert, so do give the resort a jingle for more information. SO HOW CLOSE... is the North Pole and Palm Desert, anyhow? In your heart — awww — both locations can occupy the very same spot at the same time. As for borrowing a few touchstone's of Santa's acclaimed village? The JW Marriott Desert Springs is doing so, now, with dash and more than a hint of gingery joy.